who're tucked inside the bird house. Discarded shoes litter the grass around the pine tree; two bright blue Crocs, a pair of canvas sandals. When the kids are missing for a while, I step out the back door and call to the tree. Before long, small faces peek out from among the greenery. They're perched a good fifteen to twenty feet up. Their faces and arms bear scratches from their climbing, but no one’s fallen yet. The other night, eating at the picnic table, I asked the kids what their favorite thing is about me. I had that in mind a few days later when he asked if fire would spread on rocks. Fire questions deserve follow-up, so I investigated his plan which was to make a fire on our driveway using his magnifying glass and leaves. Playing with fire, I guess, is a no-no. But we’re reading Gary Paulson’s adventure novel, “Hatchet” about a young boy stranded alone on a beach in Northern Canada. A small hatchet is the boy’s only tool and eventually he discovers how to make sparks by scraping the hatchet across some flinty rocks. Using the sparks and birch bark he is able to make fire. My son doesn’t have a hatchet, but he does have a small pocket knife that he bought with his own money at Lowes. The other day he came down from quiet time with a heavily shaved pencil. “I think I’m going to like carving when I get older,” he said, pocket knife in hand. I imagine he wanted to be like the boy in the book in some small way, so I let him make the fire. And it worked. He used flower pots to perch the magnifying glass above a small pile of leaves and bark so he could “watch from the shade.” The leaves smoked and smoldered and I reminded him not to stare at the sun’s reflection and to keep a big glass of water at his side. I stayed nearby imagining the fire somehow catching, then spreading. All it would take is a gust of wind at just the right moment, just the right angle. But I let him have his fire while his little brother squatted nearby taking it all in. “Don’t drown in the pool tomorrow,” I announce into the van’s rear view mirror. Four blank faces stare back at me. We’re running errands and I’m thinking about their much anticipated day at a friend’s house tomorrow – the one with a pool. This is my backhanded way of expressing worry and fear, the by-products of my fierce love for them. The tiniest of wrens built a nest in a small bird house in our yard. 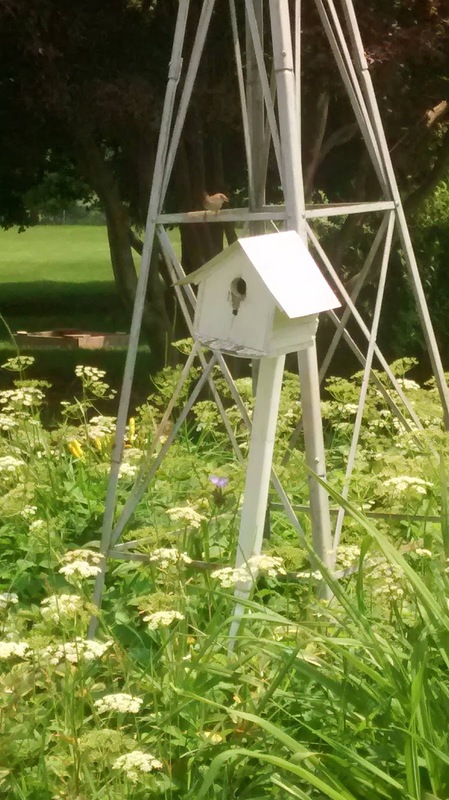 It sits under a metal windmill, in the middle of a round flowerbed. I love to see her little face peeking out of the small, round doorway. When I hang laundry nearby, she flies a few feet away to the Japanese Maple. From there, she scolds me with fierce chattering – she is trying to get my attention, to draw me away from her babies. Inside the bird house, tiny voices whirr with excitement as she comes and goes, her beak carrying food. In the evening I sit and watch her fuss. Our clueless tomcat wandered too close to the nest and she is frantically trying to lure him away. She flits across the lawn, swooping low before resting in a shrub, her machine-gunning chatter calling incessantly. “She would climb inside his mouth just to get his attention if she could,” I tell my husband. She tends her little ones with love that is both gentle and fierce. But a time will come, not long from now, when they will leave the nest. Then what? Maybe she will sleep for a hundred hours, relieved. I love this post-- adore your description of your rough and tumble 'real boy' -- just love how you allow him to explore his boyhood pursuits, sticks, stones and fire..sounds about right..your fierce love guiding, protecting, and yet allowing space for him to create and dream. Brings back memories, my son now almost 18! Cherish beautiful days with your boy..
Oh, the frightful things our children (and grandchildren) cause us to ponder....then you blink and they're 16 years old and everyone's still alive, fires and all.